Members of Lochaber Mountain Team joined Cameron McNeish as he drew the first bottle of water from the Fort William Top up Tap. Cameron McNeish, a popular broadcaster and author known for his love of Scotland’s countryside, was at Fort William to be the first to fill up from the tap installed by Scottish Water as part of a nationwide roll-out. 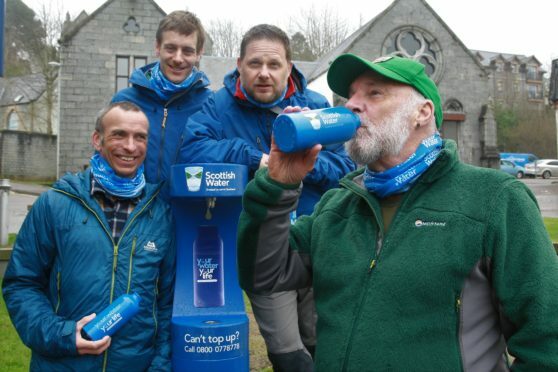 At the same time, a second tap was unveiled in Milngavie, East Dunbartonshire, so thirsty walkers can now stay hydrated at both ends of the 96-mile route – the most walked long-distance route in Scotland. Another tap has been installed in Inverness in recent days. Scottish Water’s Your Water Your Life campaign aims to encourage more people to drink tap water on-the-go to benefit hydration levels, save money and protect the planet by using refillable bottles. Renowned hillwalker and climber Mr McNeish was joined by members of the Lochaber Mountain Rescue Team in helping draw the first water from the tap. The West Highland Way attracts around 85,000 people every year and as many as 30,000 people complete the full length of the route.